The Duke and Duchess of Sussex have arrived in Dublin for their first official overseas visit since their wedding. It will be Prince Harry and Meghan's first trip outside the UK since getting married in May. They were greeted by Taoiseach (Irish Prime Minister) Leo Varadkar at Government Buildings in Dublin. Crowds had gathered outside and cheered as their convoy pulled up. Mr Varadkar walked the couple across the courtyard to show them the foundation stone which was laid by Edward VII in 1904. Inside, they signed the visitor's book. Later on Tuesday evening, the couple will attend a garden party at the British Ambassador's residence at Glencairn. Crowds gathered outside government buildings as the royal couple arrived. Even the helicopter buzzing overhead didn't drown out their cheers. Some American tourists stumbled across the visit by chance and couldn't believe their luck. Others from Dublin stood in the sunshine in the hope of catching a glimpse of Harry and Meghan. Wednesday is likely to draw more crowds and provide a chance for the couple to meet people. They are also due to meet Irish President Michael D Higgins. The visit, at the request of the British government, is expected to attract a lot of media attention. They will visit Croke Park, the home of Ireland's largest sporting organisation, the Gaelic Athletic Association (GAA). The couple will see the Book of Kells at Trinity College Dublin and will visit the city's famine memorial. 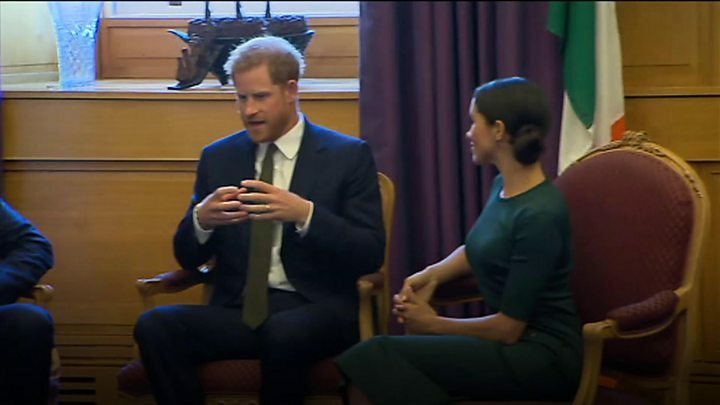 The Duke and Duchess will also visit DogPatch Labs, a co-working space for technology start-ups, where they will meet children and young people taking part in workshops, and talk to female tech entrepreneurs. The royal couple made their first official visit to Northern Ireland in March. Those who met them said that they praised Belfast people saying that they were "so friendly and warm".